The results are in. After 6 weeks of traveling across the Andean altiplano from the shores of the great Salar de Uyuni salt flats to the high valleys of Cochabamba, meeting hundreds of producers and hosting intensive reflective workshops for 49 participants (n=49), almost 80% women, I have captured a glimpse into how quinoa production is affecting the well-being of Andean women. 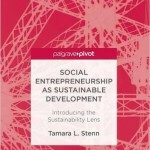 Based on the Stenn Method of ethnographic research which includes a fully participatory reflection of the theme of well-being and sustainability followed by guided discussion, five main themes emerged: nutrition, organic, land, gender (woman), price, climate. In the Andean style of reciprocity and balance, each theme is presented with a positive and negative interpretation. Below is a chart showing how the themes were interpreted. The counts as seen in the graph, represent how often a particular theme was referenced during the reflective monologue which all participated in. The 2+-hour long workshops were hosted at three key locations: Salinas, Quillacas and Anzlados. Traditionally they are offered just to the women but with the Andean tradition of indigenous leaders actively participating in community affairs, male leaders were also permitted to attend the meetings. This brought an interesting dynamic to Quillacas workshop. Two projects were promoted by men, the re-development of a quinoa processing plant and improved mechanization of quinoa production, and a lively debate ensured at the conclusion of the Quillacas workshop as to whether the women really worked harder than the men or not. The following is a brief interpretation of the findings. A more complete interpretation will take place in September when I present the findings at the Human Development Capabilities Association annual meeting in Washington, DC, later in a paper due for publication in December and a pivot book due in April. Climate: Climate was mentioned a total of 15 times during all monologues, that extended over almost 3 hours of taped time. The positive aspects of the climate mostly came from the Anzaldos region where quinoa was often intercropped with potatoes and wheat as a form of pest control, but is not commercially produced. Almost 75% of all climate related comments were about recent climate changes which included highly variable weather including droughts, early frosts and hail. This makes quinoa production unpredictable and can drastically reduce yields. Traditionally, women were in charge of the quinoa planting and planted different varieties together to provide more crop security, though lesser yields. Some varieties were more drought resistant others more frost resistant. This way there would always be some sort of harvest. However, now people cultivating much larger areas of quinoa and using single varieties, since that is the market demand and quinoa must be sorted by variety before being sold. Having crop insurance on yields, methods to protect against frost or hail, and irrigation are needed for more crop security in these times of climate change. Land: Bolivia’s 2009 constitution guaranteed women rights to land ownership for the first time, though with the demand for quinoa producing lands growing and land values rising, women’s land rights are not being recognized. It is particularly hard for single women, widows and the elderly who often do not have male family support to defend their land rights. In addition, women’s land parcels are smaller than the men’s because of the assumption that a woman when married, will travel to her husband’s lands and farm with him therefore not needing as much land as her brothers. Land division is also problematic between neighbors as land parcels are often spread about different areas and climate zones and boundaries are not always clear. The few positive comments about the land were in reference to its ability to produce quinoa. Nutrition: One of the most active areas addressed with a 93% positive response rate was the high nutritive quality of the quinoa and its complex proteins. Especially in the town of Quillacas, women were very proud of the quality of the quinoa and the health of their children when eating it. With the prices of quinoa dropping, women are realizing it is best to consume the quinoa themselves, instead of selling it, enjoying greater nutritional value than the processed noodles and rice they had been recently buying with their quinoa earnings. The negative food comments referred to this recent habit of consuming processed foods instead of the quinoa. There was a large consensus across all communities that local quinoa consumption was important and needed to be engaged in more. Some women asked for additional recipes, others expressed the desire to engage in larger scale commercial quinoa food production such as cookies, noodles and bread. Organic: Also very much on people’s minds was the organic certification, scaling of quinoa production and regulations. Bolivia has traditionally engaged in organic quinoa production and has references to organic production as part of their constitution. However, with the recent hyper-expansion of quinoa production, mono-cropping and climate change, new challenges have come to the organic farming regions. For the first time, insects, moths, worms and mildew are now regular, serious threats to the quinoa harvests. It is tempting for farmers to spray the plants with chemical insecticides to protect their harvests but this destroys their organic certification. Natural pest control methods are about 80% efficient at best, the women report, and are very unpredictable, time consuming, sometimes expensive and must be done as a preventative measure, which makes it harder to understand or measure their effectiveness. In addition, with more land in cultivation, llama herds which used to be managed by quinoa growers themselves, have been moved to higher elevations to make room for more quinoa production in the flats which are more accessible by tractor for plowing. These herds are now often managed by different families, not the quinoa growers. Llama manure is the preferred fertilizer for organic production and now needs to be purchased at ever higher prices. With the uncertainty of the climate and future market prices, farmers are concerned about the costs of inputs for organic production. 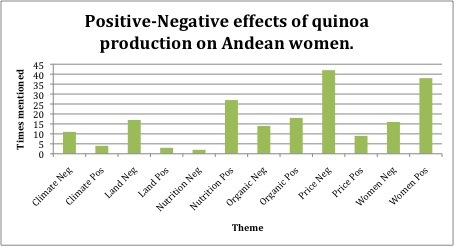 Price: The most pressing concern for the well-being of Andean women was the sudden, severe drop in the value of quinoa. Taking nine months to grow, women planted large amounts of quinoa with high costs both monetary and in time associated with production for labor, fertilizer, pest control, harvesting and processing, assuming that prices would stay the same or increase as they had been for years. Instead within nine months they dropped by more then 60%. The inputs were already spent. The women were left with what they had anticipated would have been thousands of dollars of product which now had little value. Most were saving their quinoa until better prices could be negotiated. It seemed all would end up selling their quinoa at a loss. They were very concerned about starting the new harvest this month, not knowing what the May 2016 market prices would be, and worrying about climate change and insects that could destroy their yields as well. Even world Fair Trade prices for quinoa, did not meet the costs the women had in their current quinoa production. There was much worry and uncertainty about what to do. The positive price indicators were in reference to the past three to five years (before the 2015 quinoa price drop) as the quinoa increased in value and brought families back to the lands and re-invigorated community farming again. Women: This was a gender based category as women are historically marginalized in Bolivia and their well-being often compromised with household chores, cooking and childcare responsibilities they often share alone. In addition, violence against women by both men and other women is common in Bolivia. Though the new constitution has done much to bring attention to the women’s plight, enforcement of the new laws of equality and freedom from violence are is often lacking. The almost 40% negative comments were made in relation to the violence the women experienced by other women as they were chastised for speaking up, taking leadership roles, or directing their own development. Women are often jealous or mistrustful of each other, a common theme that has a deep history in Bolivia. In Bolivia there has been a re-awakening of the Andean tradition of chachi-warmi (man-woman) with the idea that men and women together compliment each other and must work together in the household and economic development. This, as the woman Mallku (regional indigenous leader) of Salinas points out, makes it difficult for women to act independently. It also shadows the actual work they do since the chachi-warmi extends largely to the quinoa work but not the animal care, child care, food preparation and washing the women do. So people act as though the women and man are working together equally but in fact they are not. Never-the-less, this movement towards equality can have a positive aspect too. Men are more conscious of their role as family partners with the women. In addition, I counted the women’s desires to work together on food processing projects, to start local quinoa production businesses and to ask for technical assistance in this as positive. I saw it as a leadership move, self determination and a sign of confidence. The men were also supportive of the community working together with quinoa transformation projects. More value was starting to get put on he local markets where the women (and men) felt they still had opportunity, control and influence. The governor of Oruro publically stated that he would welcome pre-made quinoa products as part of his regional school breakfast program. This is just a rough explanation of the well-being of Andean women. They are well fed, their children are in school and there are more economic opportunities for the future generations, but there is great uncertainty and instability in Bolivia’s vast quinoa market. The people re resilient and do not give up. They are working now to strengthen their image as Southern Altiplano produces of the best, most nutritive, highest quality, organic quinoa in the world, put an internationally recognized trademark in the Quinoa Real variety that only they produce, and educate the consumer on the many different types of quinoa, its uses and properties so there is more diversity and consumption of all quinoa on a world level, in thoughtful and meaningful ways.